Do library statistics tell us what you want from Falvey? Absolutely! For instance, ever since Falvey Library purchased two Kindles last year, they have been in non-stop circulation. Based on that data, we’re planning to purchase more e-readers in the future. Do you want the Library to make these and other cutting-edge technologies available to our students? Which new technologies would you prefer? One way the Library answers such questions is to gather statistics. Last year, for example, Falvey maintained 16 Dell laptop computers for you to borrow. Although Falvey’s laptop computers are for Library use only, they are capable of sending work to the Library’s public printers or to I-print. Last year Villanovans borrowed these computers well over 5,000 times, which is the reason we’ve expanded our pool of circulating laptops to include three MacBooks. 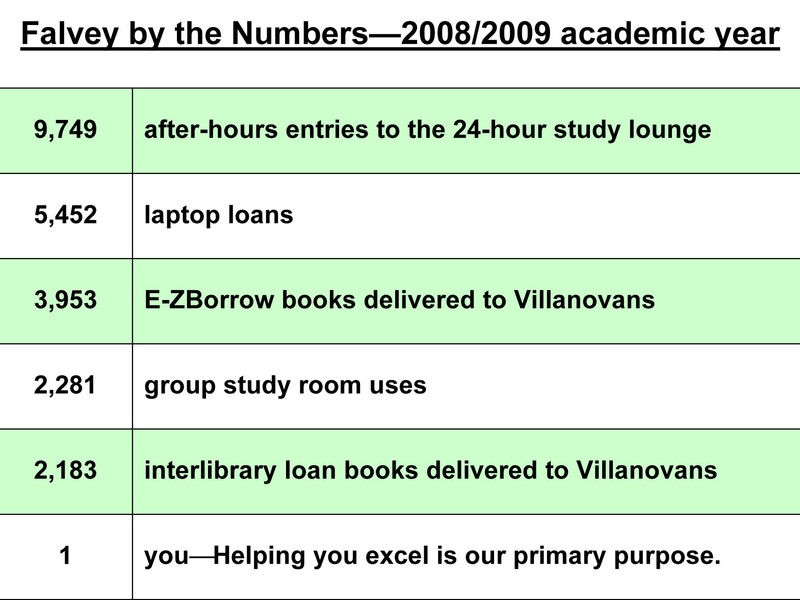 In addition to technological items, last year Villanovans borrowed 6,136 books from other libraries though E-ZBorrow and InterLibrary Loan. The E-Z Borrow system links 75 academic and research libraries in Pennsylvania, New Jersey and West Virginia. If E-ZBorrow member libraries don’t have the book you need, try InterLibrary Loan (ILL). Through ILL, you can borrow books from academic libraries across the country and even internationally-at no cost to you. Requesting books for your courses this way, instead of purchasing them, can save you a good deal of money. We know that students use Falvey Library to study. Did you know that Villanova students used the Library’s group-study rooms 2,281 times last year, and they accessed the after-hours study lounge nearly 10,000 times? When classes are canceled due to winter weather, as they were quite recently, Falvey’s study lounge, accessible 24 hours with a valid Wildcard, provides an alternative to studying in your dorm. As the Library relies on statistics in determining the services we provide to you, we also depend on your comments, feedback and suggestions to help us better serve you. Tell us what you think on Falvey Library’s Facebook page. It’s where we announce library events, post new service and resource updates, and hold timely discussions. Or you can make a suggestion on the Library’s homepage. Submit your questions via email with the “Ask a Librarian” link (on Falvey’s homepage). Click on the “Get Help” tab. Some librarians have online chat sessions, which can be initiated from the Subject Guide pages.